Some cats just really love their dry food. I’ve lived with a few of those myself! But finding a way to switch your cat to wet food is important for her health. 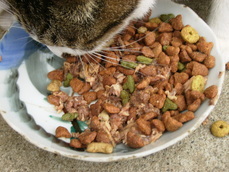 Did you know dry food can cause obesity and gum disease? And many veterinarians believe cats on mostly-dry-food diets are always slightly dehydrated. With patience and determination, you can switch your cat to wet food. Just try these suggestions. 1. If your cat eats both wet and dry food now, gradually decrease the amount of dry food she gets and increase the amount of wet food. You want your cat to be healthier, not stressed, and suddenly taking away all of her dry food could make her very stressed! 2. Put a bowl with just a bite of wet food beside her bowl of dry. She might be curious about what’s in the second bowl and decide to give it a try. Don’t give up if she doesn’t eat the wet food right away. It can take time to switch your cat to wet food, and you might have to do this for several days before she works up the courage to taste what’s in that other bowl. 3. Put several pieces of her dry food or some of her favorite treats on top of the wet food. Again, give her just a bite. If she eats the dry food or treats off the top, press them into the wet food. 4. Entice her to eat the wet food by sprinkling Parmesan cheese, Halo Liv-A-Little treats , Stella and Chewy’s freeze dried raw food (my cats like the chicken) or bonito flakes on top of the food. Pure Bites are another freeze dried chicken treat that cats love. The dog and cat treats are exactly the same, except the dog treats come in a bigger bag. 5. Something else to try is drizzling some of the liquid from a can of tuna on top of the food, or just add a little bit of tuna. 6. Put just a tiny bite of wet food under some dry food in a separate bowl. Gradually increase the amount of wet food you hide under the dry. 7. Offer your cat meat baby food (chicken, ham and turkey are the most popular), deli chicken or turkey with no preservatives or added flavoring or tuna to get her used to eating food that doesn’t crunch. 8. Dip pieces of her dry food in wet food so she can get used to the taste and smell of the wet food. 9. Try hand-feeding her little “meatballs” of wet food. Some cats make the switch from dry to wet food quickly and happily. For others, the transition takes months, or even years. Be patient, and don’t give up! Try each suggestion for several days. It takes some cats a while to catch on. If you decide one suggestion is not going to work, wait several days before trying another so the cat doesn’t get confused and become even more resistant. And remember this: Your cat needs to eat! Cats who don’t eat are at risk for fatty liver disease, and that’s especially true of cats who are overweight. If your cat is determined to have her crunchies and is still holding out after several hours, let her have the food she wants and try again another day. To switch your cat to wet food, it has to be done on her terms, not yours!